It has been announced that May’s upcoming 25th issue of X-O Manowar, the flagship Valiant, will be an oversized 48-page stand alone story detailing the origins of the Manowar himself. Acting as a new jumping on point for readers, Robert Venditti and J.G. Jones are teaming up with Justin Jordan, Peter Milligan, Rafer Roberts and an all-star line-up of creators to really make this a special issue for fans. 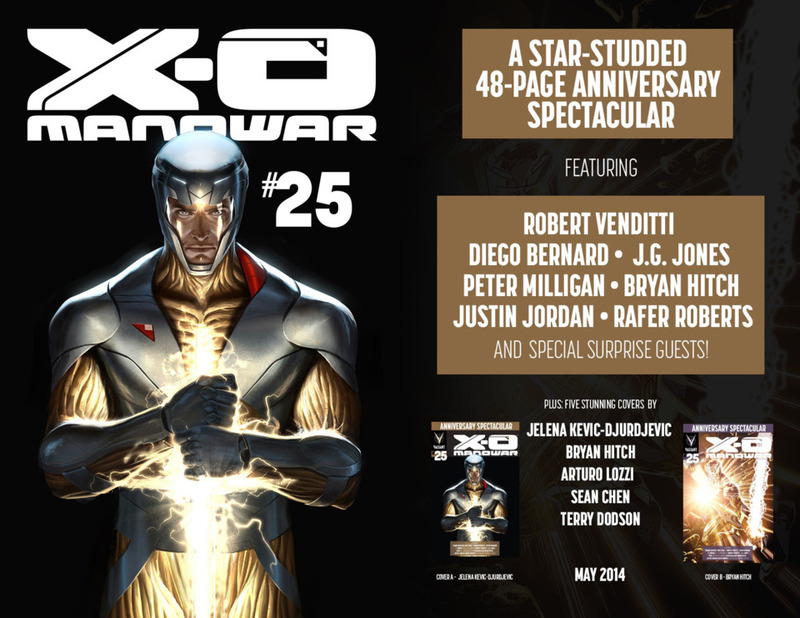 “Whether you’ve been reading X-O Manowar since issue #1 or you have yet to pick up your first issue, X-O Manowar #25 is a can’t-miss comic book event celebrating the character’s past and future with a spectacular array of brand new stories! Featuring stunning shelf covers by JELENA-KEVIC DJURDJEVIC (Thor) and BRYAN HITCH (Age of Ultron), X-O Manowar #25 will also feature an Armors Variant spotlighting the different incarnations of the X-O Manowar armor throughout the ages by artist ARTURO LOZZI (Bloodshot); as well as Valiant’s very first throwback cover by Valiant icon SEAN CHEN (Iron Man); and an iconic, fully painted variant cover by superstar artist TERRY DODSON (X-Men) – his first piece for Valiant! X-O Manowar will be released in May. What are your thoughts on this special anniversary issue? Have you been keeping up with the series? Planning to pick it up maybe? Leave your thoughts in the comments below.